FileMaker solution for running a small business. Is there a better alternative to FMSmallBusiness? Is FMSmallBusiness really the best app in Applications category? Will FMSmallBusiness work good on macOS 10.13.4? FMSmallBusiness is a cross platform solution built using the award winning FileMaker Pro database platform. You can run it on Mac, Windows, or a combination of both. If that's not enough, portions work on the iPhone or most Web browsers. We've designed it to work as either a single or multiple user solution on up to 250 workstations. Calendar To Do's / Adjusted Calendar To Do's to stretch with the screen width. Changed the Event Time Drop Down List. / Changed to include the time on the hour, 15 after, 30 after, and 45 after. Week View Printing / Fixed a calendar cell that was showing data from day 4 of the week instead of the correct day 5 data. FileMaker Pro 10.0v3 or later, FileMaker Server is suggested. FMSmallBusiness needs a rating. Be the first to rate this app and get the discussion started! 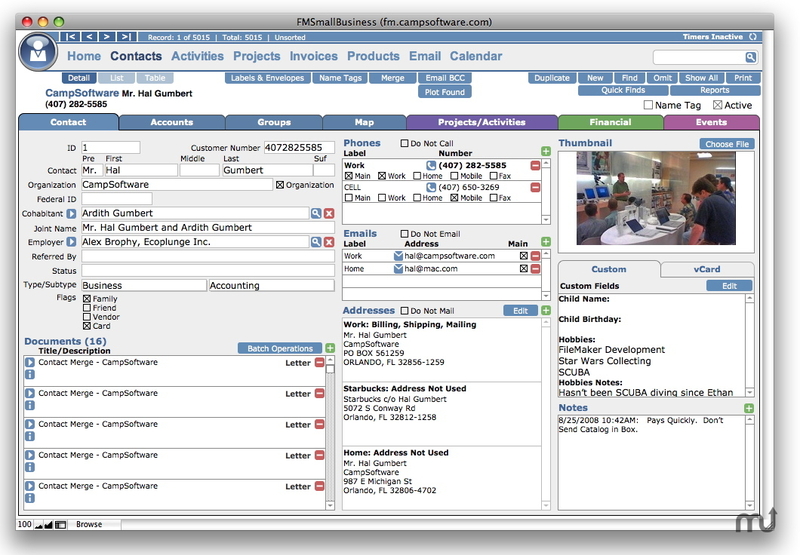 Customizable - FMSB is built on FileMaker Pro and developed from the start with individual customizing in mind. FMSB has a 'main' file and a 'custom' file. The custom file is designed in an open fashion so that anyone with FileMaker experience can make changes or even add functionality. Shared Contacts - Access your Contacts in one centralized location. When you change the details for a contact, everyone in your company will benefit from the updated information. Shared Calendar - Calendar events function in a similar manner as Contacts. Whenever an event is edited, the changes are automatically made for everyone in your company. Projects & Activities - FMSB makes task management easy because it has the ability to store your activities with the option of assigning them to a projectï¿½Great when itï¿½s billing time! Projects and Activities can be assigned to a contact and staff member It can also include billable items, such as labor, attached for later invoicing. Income Catching - Track your time and and stop loosing income by tracking your time and items using FMSB's built in Timers, Activities, and Events. Invoices & Products - FMSB has built in Invoicing as well as a Products modules which can help with reordering levels. Shared Documents - In many small businesses, you have documents that are related to your contacts and activities. FMSB has the same functionality. Each contact or activity can store as many documents and letters as you'd like--And they can be accessible to everyone in your company. Mail/Email Merging - Track all correspondence with your contacts. We've created easy to use Document generation and Merging assistants to make document storage simple. Data Availability - Access your data at your desk, on the road, or on your phone. Your data can be accessed via your computer anywhere in the world via the Internet over a secure connection. Plus you can use your iPhone to access Contacts an Events. Contacts Map Plot / Fixed an issue with the Address Description to now show the Address and Phone Numbers. Contacts Map Tab / The Map 'To' Address on the Map Tab will now automatically itself if it is empty to the Billing Address. If there is noBilling Address, it uses the first address. Fixed Contact Address Searching / Fixed Find Mode AddressSearch where the County field was searching the Country field's data. Quantity Summary / - Added a Quantity Summary below theInvoice Line Items on the Invoice Detail layout and the PrintedInvoice. Changed Database Requirements / Now Requires FileMakerVersion 11 or FileMaker Go for iPad & iPhone. While FileMaker Go can now open FMSB it is partially supported. Any items that require FileMaker Extensions, Unsupported Script Steps, or Unsupported Functions will not work and may cause data loss. PLEASE backup often. Fixed Documents Navigation Problem / Fixed a problem where adding a Document to Common Documents did not return the user to the original Document.